There's a lot to like in automated network that delivers insights for UC and other enterprise decision makers -- and lifts Cisco out of the switching doldrums. 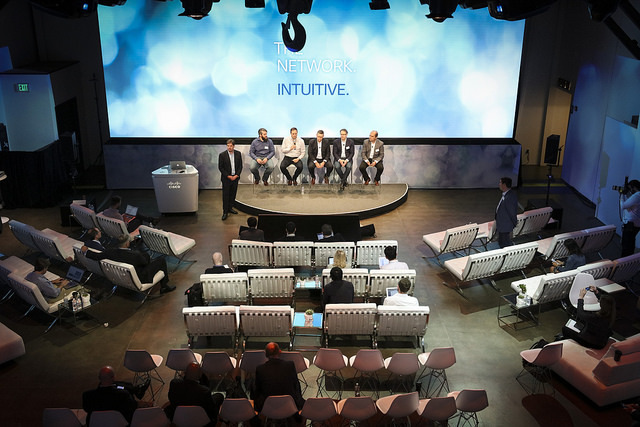 Cisco earlier this week introduced "intent-based networking" (IBN) solutions at an event that had lots of flair and panache and the presence of many key executives, including CEO Chuck Robbins, SVPs David Goeckeler and Rowan Trollope, and VP and Chief of Staff Ruba Borno. Given Cisco has been the market leader in networking for decades now, does the launch of a new network system really warrant its own event, and is it a big deal? I believe it does and is... and that over time we'll look back on this launch as a seminal moment in Cisco's next act. Before I get into why I feel this way, I'll first explain what the heck an IBN is. Today's networks are extremely manually intensive to operate. Engineers must be familiar with a cryptic command line interface and repeat many tasks, box after box, to implement a change. Software-defined networks (SDNs) have made networks easier to manage by automating certain tasks, but engineers still need to identify all the tasks. With an IBN, the administrator determines the "what," and the system then figures out the "how." A good analogy to help understand this is the difference between an automated car feature and an autonomous car. Parallel-park assist automates the task of parking, but the driver still needs to drive to the destination, look for parking spots, and determine which is the best one. With an autonomous vehicle, the driver would issue the command "go home," and the car would figure out the least-congested route and determine the best parking spot, which may or may not include parallel parking. Automation makes the parking process itself easier, whereas the self-driving car would transform the entire experience. IBN lets network administrators issue commands like "put all my IoT devices in a single zone" or "prioritize bandwidth for the top 10% of my UC customer base" and rely on the network for all the behind-the-scenes magic that makes it happen. If devices move or things change, the network automatically reconfigures to adapt. Cisco's IBN is a closed-loop system that continually gathers contextually relevant data from a number of different sources, including network devices and IoT endpoints. Using machine learning, the system delivers insights that can help enterprises make better business decisions. Note that DNA Center is the "brains" of the system, as well as the interface network managers would use to assess users, endpoints, network devices, and other information in creating policies that feed the system. While DNA Center will optimize functionality with the new 9000 switches, it also will work with older generations of Catalyst switches as well as Nexus switches, branch routers, security devices, and Wi-Fi access points. The encrypted traffic analysis technology is worth calling out as well, being the only security technology I know of that can find malware in encrypted traffic. The bad guys, getting ever smarter, are now making malware nearly impossible to find by hiding it in encrypted traffic. Rather than unencrypting traffic, which can add significant cost and processing overhead, Cisco analyzes traffic patterns and uses machine learning to infer malware. It claims to have 99.99% threat detection accuracy. The business value of an IBN is significant. Network operations are slow and error prone. My research shows that even with automation, the number one cause of downtime is still human error, which occurs because engineers are constantly cutting and pasting commands and tweaking the system, often without realizing what the changes mean to the broader environment. With an IBN, network engineers make all changes through DNA Center, speeding the process while reducing errors. Network operations struggles today because of the increased complexity from more users and more devices. However, with IoT right around the corner, in the words of Bachman-Turner Overdrive, "B-b-b-baby, you just ain't seen n-n-nothin' yet." The number of connected devices is about to explode and drive complexity through the roof. Cisco's IBN system can simplify operations as it masks much of the complexity through the DNA Center software. Also, the SD-Access piece enables businesses to get much more granular with policies. The current Cisco infrastructure lets companies set up coarse-grained segments such that a hospital, for example, could create a policy that says "put all clinicians in a secure zone." That has value, but what if by policy the hospital could also allow nurses, doctors, and technicians to access a finer-grained segment within that zone? IBN brings DevOps-like agility to the network, effectively modernizing it. Speaking at the event, one of the early field trial customers said he was operating with parallel IT teams -- a DevOps-focused one with agile development processes and the other using legacy processes. Cisco's IBN solution would enable him to bring these two teams together as the legacy network was too slow to keep up, he said. IBN could even be the savior for people running the network. Almost every IT leader I talk with has expressed the need to reskill the workforce, in one of two ways -- either by retraining or by replacing. Engineers and administrators can't retrain if they're busy running around fighting fires with manual processes. The only way to retrain is to automate the non-strategic stuff and then learn new skills. One CEO I talked to about a month ago said something to the effect of: "My IT staff is useless. I don't want them to be. I need them to help me innovate, but they can't because they don't have the tools to automate the repetitive stuff." Now they do. Despite the media event, I felt Cisco almost downplayed IBN's importance to the company's future. Since Robbins took the helm as CEO, Cisco has had a remarkable turn of fortune as growth in security, collaboration, and other groups has skyrocketed. For the first time in a decade, the stock price is over $30; investors are buying into the Cisco growth story. However, switching -- specifically campus switching -- is the one piece of the business that has remained weak. The challenge with campus networks is that the upgrade driver has always been speed. Businesses went from 10 Mbps to 100 Mbps to 1 Gbps, which kept a steady three- to five-year refresh cycle going. But most businesses I talk with require no more than 1 Gbps of capacity, so many now have equipment getting close to 10 years old. In actuality, Cisco has had a few differentiated campus features, like TrustSec, but for many enterprises the difficulty level of getting it deployed has outweighed the benefits. In any market, a lack of differentiation leads to pricing pressure... and then eventually to commoditization, and campus switching is heading that way. Cisco's challenge is to convince enterprises that they should refresh the network for something other than speed and port density. Until now, however, it really hasn't had a credible story to tell. IBN shifts the upgrade drivers away from speeds and feeds and to automation and security, positioning Cisco not to have to compete on price. For the first time in years, Cisco can approach business customers about accelerating the refresh cycle. Additionally, Cisco built the Catalyst 9000 switches on a new version of its operating system, IOS XE, which improves the software structure of previous releases. It's modular, lets customers upgrade features instead of the whole OS, and allows application developers interface with it through APIs instead of the command line. Cisco has talked the software talk for years, but its transition has been limited to shifting to a software-like revenue model. Lately Cisco has been much better about doing things software companies do, and that includes offering feature-rich APIs so third parties can add value on top of the Cisco infrastructure. Rome wasn't built in a day, and neither will enterprises transition to IBN quickly. Early trial user feedback is unanimously positive, but that doesn't mean there aren't training, operational, and other issues to work out. In addition, Cisco's solution only offers full functionality with the new 9000 switches, so I anticipate new routers, access point, and security devices coming as well. At the event I asked Robbins how long he thought this transition would take, and where and when we might see a large number of customers accelerate ahead of a normal refresh cycle. Three to four years, he answered, but then said he was being deliberately conservative because the concept is so new. Cisco's new IBN solution is certainly a different way to think about the network -- and that's something that's badly needed today, and is something that's good not only for Cisco itself but enterprises, too.